Already the Romans had built a temple on the slightly elevated Pla de la Seu, where the the Cathedral of Barcelona is located today. 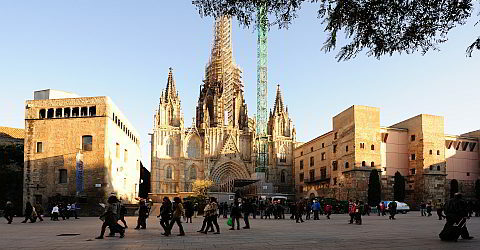 The Cathedral is dedicated to the martyr Santa Eulàlia, the patron saint of Barcelona. She was tortured to death in late Roman times. Her corpse is buried under the main altar. Santa Eulàlia is always celebrated on 12 of February. Booking is really easy: simply enter the number of persons you would like to book for on the upper right corner and chose the desired date, then click on "Add to cart"
Although the actual Gothic church was completed as early as 1448, over the centuries the appearance of the church was changed again and again by reconstructions and additions. The last major renovation was in 1913 with the completion of the middle tower. You can find many epochs of European architecture at the Catedral de la Santa Creu i Santa Eulàlia. Christianization started very early in Barcelona. The martyrdom of Saint Eulàlia during the persecution of Christians under the Roman Emperor Diocletan (Emperor from 284 to 305) point to this. The oldest findings of an early Christian church date back to the 4th century. It was a three-aisled building. And although there are no scientifically proven documents from this period, it is believed that back then it already was a cathedral and therefore had a bishop's seat. In one of the chapels of this early Christian church, the relics of Saint Eulàlia were kept. With the conquest of the Iberian Peninsula by the Moors in 711 they were hidden in a different church, presumably in Santa Maria del Mar or Santa María de les Arene. In 877 the bones were rediscovered. In 985 the simple cathedral survived the destruction of Barcelona by the Moorish ruler Almansor. The church remained standing until 1046, when the Count of Barcelona, Ramon Berenguer, began the construction of a Romanesque cathedral. This Romanesque church was completed in 1058 (the "Second Cathedral"), but as early as May 1, 1298, constructions took place on top of the foundations of the early Christian church and the Romanesque cathedral: the current Gothic cathedral was built. The unadorned facade seemed to bother many: on the initiative of the industrialist Manuel Girona Agrafel, the construction of the facade began in the end of the 19th century according to the original plans from the 15th century. The neo-gothic style facade and the two side towers were inaugurated in 1913. The Cathedral of Barcelona consists of three naves, but only has one apse. The ships consist of five sections, the one at the facade is the longest. In order to use the space between the smaller buttresses of the aisles, the structure of the Catalan Gothic proposes secondary chapels around the whole building. Each of the sections, which are bounded by massive pillars between the ships, has two of these inwardly open chapels. Above the chapels you can see a large window gallery on the outer wall of the basilica. You should definitely visit the cloister with small chapels, gardens, fountains, medieval tombstones and even geese whose chatter you can hear from the church building. The 13 white geese are said to symbolize the age of Eulàlia when she suffered her martyrdom. That may well be true, but the existence of this tradition of goose husbandry is due to a very practical feature of the geese: their deafening noise was a good barrier against unwanted intruders and thieves. Especially on hot summer days, the cool cloister is a blessing. From the cloister you reach the small museum. In this museum you will find two very precious statues representing the Santa Eulàlia and an equally precious monstrance of pure gold. A monstrance is a liturgical display in which the host is presented. In the "Sala Capitular" you can admire beautiful ceiling paintings. You can visit the cathedral without paying admission (hours, see above). But in the paid admission the chorus, the visit of the roof and the museum are included. If you'd like to enjoy this beautiful church building when it's quiet, visiting during paid admission hours is also worth it.